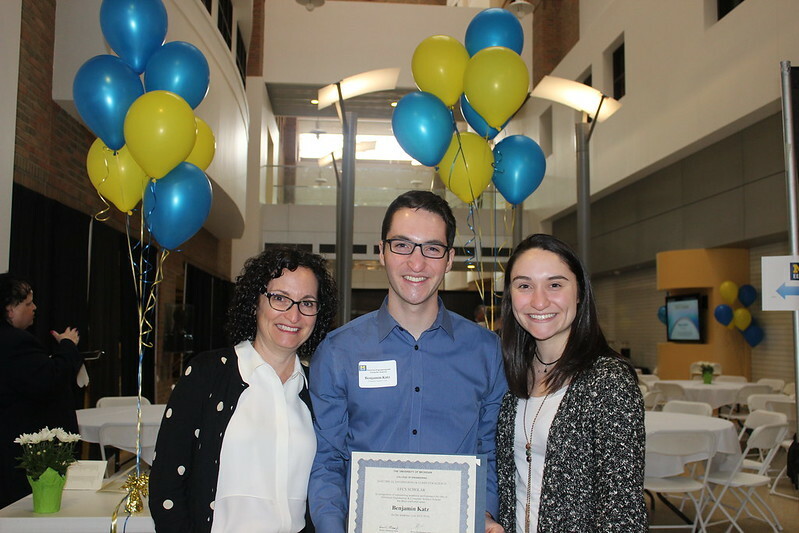 Students, parents, and faculty gathered on Friday, March 11, 2016 to celebrate the achievements of EECS students who earned a special award for academic achievement, research, service, or entrepreneurial activities. Khalil Najafi, Chair for Electrical and Computer Engineering, and Marios Papaefthymiou, Chair for Computer Science and Engineering, presented the awards. Presented to an outstanding student from each program offered within the College of Engineering. Students are selected by each department on the basis of academic and personal excellence. Presented to undergraduate and graduate students of the College of Engineering who have demonstrated outstanding leadership and service to the College, University, and community. Presented to an undergraduate student leader who has made valuable contributions to the College, University and/or community. Awarded to an undergraduate engineering student to explore non-technical fields to develop, broaden, and enrich his or her education. Aawarded to a second year undergraduate student who has made valuable contributions to the College of Engineering community. Presented to an outstanding junior who has demonstrated academic excellence. Presented to an outstanding senior on the basis of sincerity, integrity, and goodwill. Presented to an outstanding senior student from each of the three programs of study (EE, CE, and CS) in EECS. Students are selected on the basis of outstanding overall academic and personal excellence. Presented to a top student from each of the three programs of study (EE, CE, and CS). These students are in the top 10% of their class and have an interest in communications and computers, as well as professional interests and activities. Given to students who completed an outstanding research project with a faculty member or graduate student over and above the requirements of a course or an independent project. Presented to students who have shown exceptional leadership in their student organizations, service to the University, College, or Department, or service to the community. Presented to an electrical engineering student who stands first in his/her class at the completion of the freshman year. Presented to an electrical engineering student with an interest in acoustics or amateur (ham) radio. Presented to a top student from each of the three programs of study (EE, CE, and CS) who exemplifies a partnership between engineering and business through involvement in or startup of a private business, patents, or partnerships with corporations, furthering their field of knowledge or interest. Given to EECS Seniors (85 credits and above) who have been at U-M at least two full semesters and have a cumulative 3.9 GPA or greater as of Fall 2015. These awards provided funding for students to work with faculty members on research projects of mutual interest. Following is a list of projects and participants.